In 2010, Dr. Lewis Gross, also known as the Holistic Dancing Dentist, wrote a book called Montauk Tango that’s based in Montauk, New York. This fictional story follows Lewis and Tracy as they relocate from a post-9/11 New York City to their summer home in Montauk and open a restaurant. Montauk has been the setting of some of the most beloved stories, but many gloss over a bizarre event that happened in 2008. In July of 2008, an unidentified creature washed up on the beach near the business district of Montauk. The story was originally publicized in The Independent, a local newspaper, which stated that a 26-year-old woman and three friends found the carcass of the creature while looking for a place to sit and enjoy the afternoon on the beach. A black and white photograph of the creature ran alongside the article, which speculated that the “animal” might be some kind of turtle or a mutant experiment from the Plum Island Animal Disease Center. It was also noted that Larry Penny, the East Hampton Natural Resources Director, had concluded that it was a raccoon that was missing its upper jaw. Several theories about the nature of the creature were thrown around, but the carcass was promptly removed from the site where it was found. Within days of the discovery, the name “Montauk Monster” was coined and searched globally on the Internet. 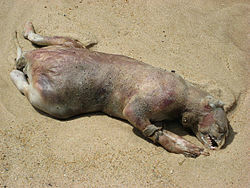 Snopes.com has listed the Montauk Monster as an urban legend, and the case has been featured on television shows, including Jesse Ventura’s Conspiracy Theory and Ancient Aliens. Still, no proof exists to reveal what the creature was and where it came from. Some scientists think the creature was a sea turtle, a rodent, a canine, or a sheep, but there are flaws in each one of those theories. At this point, more proof points to the creature being a raccoon than anything else, but, as with most urban legends, it’s likely that the world will never know the truth. So, what does this have to do with Dr. Lewis Gross’ book? Well, the Montauk Monster story is one of Montauk’s most recent claims to fame, and it may just be discussed within the pages of the novel. For more information about Dr. Lewis Gross and Montauk Tango, visit montauktango.com. This entry was posted in Montauk and tagged about montuak, dancing dentist, dr leiws gross, holistic dentistry, Montauk Tango, montuak monster, montuak ny. Bookmark the permalink.